Design is one of the most fast-paced fields in the art world, as professionals, students and teachers must reckon with new technologies before the older versions have much time to collect dust. 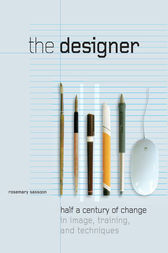 In The Designer, Rosemary Sassoon surveys fifty years of change in the world of design, evaluating the skills that have been lost, how new techniques affect everyday work, and how training methods prepare students for employment. This indispensable volume reveals how design is both an art and a skill – one with a rich past and momentous relevance for the future. Along the way, Sassoon traces the fascinating trajectory of her career, from its beginning at art school and an early apprenticeship to her work as an established professional, with advice for designers at every stage of their own development. Weaving together biography and career advice, theory and practice, The Designer provides a unique history of the art form and looks ahead to an age of ever-changing attitudes to drawing, aesthetics, and artistic practice.